The Queen and Irish President Michael D Higgins have hosted a Northern Ireland-themed reception at Windsor Castle. The event was held on the penultimate day of Mr Higgins' four-day state visit to the UK. It celebrated British and Irish people who have made a significant contribution to the peace process and to public life in Northern Ireland. Mr Higgins is now attending an Irish-themed event at the Royal Albert Hall. For the second time this week, Sinn Féin's Martin McGuinness was among the guests at a Windsor Castle reception. 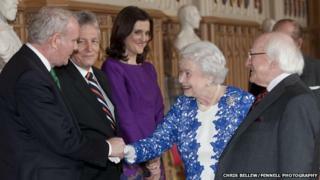 Mr McGuinness shook the Queen's hand as he arrived at the event on Thursday evening. The former IRA man is now the deputy first minister of Northern Ireland and has played a leading role in the Irish peace process. He was among a number of politicians, including ministers from the Northern Ireland Assembly and MPs, who were invited to the event. Representatives from peace-building charities, including Co-operation Ireland and Corrymeela, were also present for the function. Many of the guests were expected to travel on to the concert later on Thursday evening. The organisers said the concert would celebrate the contribution of the Irish community in Britain and the "strength and range of collaboration and creativity between Ireland and the United Kingdom". They added that the line-up includes "some of Ireland's finest musicians, singers, actors, authors and poets". Northern Ireland singer-songwriter Paul Brady, Oscar-winning musician Glen Hansard, actress Fiona Shaw, best-selling author Joseph O'Connor and TV presenter Dermot O'Leary are on the bill. The event is called Ceiliúradh, which translates as celebration. Mr Higgin is the ninth president of Ireland and the only Irish head of state to undertake an official state visit to the UK. The four-day diplomatic mission is aimed at celebrating Anglo-Irish links, the contribution of Irish communities in Britain and the political progress made in Northern Ireland since the beginning of the peace process. It follows on from the Queen's highly successful visit to the Republic of Ireland three years ago, the first by a British monarch since the foundation of the state. On Tuesday, Mr McGuinness became the first Sinn Féin representative to join in a toast to the Queen, as an orchestra played God Save The Queen at the Windsor Castle banquet. Mr McGuinness said he believed the "vast majority of people on the island of Ireland will be very supportive of me contributing to a process of conflict resolution and very important acts of reconciliation".